I’m kind of like your customers are when it comes to the omnichannel. A customer doesn’t know that the omnichannel is the seamless integration of multiple commerce channels. They know nothing about the issues involved with integrating communications and media protocols and formats. They don’t understand the technologies that connect those channels. They hardly give a thought to the Big Data analytics that are letting you deliver more personal shopping experiences to them. They don’t know nothing about omnichannel. They just know what they like. This image is the copyright of Walt Disney and is used for humorous purposes only. And here’s the thing. 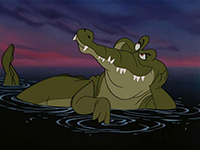 Customers are like the croc in Peter Pan: once they get a taste of something they like, they want it all the time. And they like the omnichannel a lot. They use it all the time whether they know it or not. When they load their rewards card with coupons from their grocery store’s app, they’re in the omnichannel. When they purchase clothes from a retailer’s web site and then pick the item up in the physical store, they’re in the omnichannel. When they select an item online and then dial the call center to set out special handling for delivery, they’re in the omnichannel. When they accept a new job and go online to complete the paperwork, when they buy a plane ticket online and check in with their smartphone, when they track a package: they’re in the omnichannel. They don’t know that the omnichannel is there. But they notice when it’s not. Can you remember—it wasn’t that long ago—when business wondered whether social media had any commercial value, and even farther back than that when the debate was whether a company really needed a web site? I do. And I remember well what the final argument was that made that web site an absolute business imperative. The customers wanted it. No: they demanded it. It wasn’t long before those customers began to judge the value and credibility of a company by whether it had a web site. If you didn’t have one, you weren’t really a player no matter what they were looking for. Some companies then began to push the technology farther. Marshall Industries, Amazon and others pioneered new ways to use the web, which for a while gave them extraordinary competitive advantage. Eventually, every other company followed because once customers saw how easy things could be, they wanted it that easy all the time. And that’s why the omnichannel is important. Because the customers want it. Yes, it brings significant benefits to the business: increased self service, more efficient warehousing and logistics, broader more accurate forecasting, and much more.But those are just the reasons why the omnichannel is useful. It’s important to you because it’s important to the people that buy from you. Today, they admire companies that deliver the omnichannel experience. Tomorrow, they’re going to expect it from you.